"Eastern Orthodox Christianity - Telling the truth since 33 AD"
Are you disenchanted with your current church? Are you looking for a spiritual Church that is free of politics? In today's fast-paced, changing world, we all need a solid, unchanging place to provide rest and nourishment for our souls. St. Seraphim's in High Point is a wonderful place of spiritual worship and we welcome you to worship with us. We're a small Church with a caring, and loving family atmosphere. 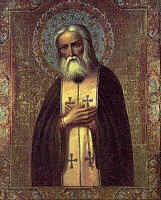 St. Seraphim's is a member of The Holy Synod of the Americas, an Independent Eastern/Western Orthodox Synod. We celebrate the Divine Liturgy of St. John Chrysostom every Sunday morning at 11:00 AM. We are located at 303 Eastchester Drive, High Point, North Carolina in the building behind St. Christopher's Episcopal Church. In Reference to the 2016 Pan-Orthodox Ecumenical Synod Meeting; we, the Hierarchs of The Holy Synod of the Americas, of one accord issue our Ecclesiastical Response. First and foremost, the Ecumenical Council of 2016 did not follow the protocol that is required By Canon Law. The Doctrines of the previous Ecumenical Councils were not confirmed and ratified at the beginning of the meeting. From the outset, this action alone disqualified the meeting in 2016 as a true Ecumenical Council. Secondly, all participants did not agree on all of the articles, some chosen participants refused to attend. Other chosen participants refused to sign the documents presented and discussed at the Ecumenical Council. These actions alone indicate that there was no “True Unity” and acceptance of the articles set forth in the meeting. Furthermore, not all of Orthodox Christendom was invited to participate. Invitations were issued to the Roman Catholic Church and many Protestant Churches. These churches were represented at the Council meeting. They were addressed as “Sister Churches”, while the Independent Orthodox Churches were excluded. Third and possibly the most disturbing of all was the implied acceptance of Ecumenism. The word “Orthodoxy” means “Correct Glory”. The word Orthodox has come to mean a strict following of the truth and correct praise and worship to the Holy Trinity. This is what we, the Hierarchs of The Holy Synod of the Americas, understand as our duty to uphold and defend. At our consecration to the Episcopate in The Holy Orthodox Catholic and Apostolic Church we made promises to defend the truth and to teach the truth. This means, in our understanding, upholding the Canons and Traditions of the Orthodox Faith as it has been handed down from the Apostles of Jesus Christ our Lord, God and Savior, and the Holy Fathers of the Seven Ecumenical Councils. Often, Independent Orthodox Churches are ostracized and declared non-Canonical by the Main-Line Orthodox Churches under the Ecumenical Patriarch of Constantinople. When the Ecumenical Patriarch openly commits acts that are against the Holy Canons of the Church as defined by the Apostles and the Seven Ecumenical Councils, does that not call into question the Canonical Status of the Main Line Orthodox Churches? The Pan-Orthodox Ecumenical Council of 2016 was controversial at best and clearly indicates that the Main Line Orthodox Church is “Rudderless” in a sea of heresy. Having not been invited to the meeting we were not offered a chance to accept or refute the articles that were considered by the Council. Based on the vast body of evidence that is now available; however, we reject the blatant acceptance of Ecumenism that was at the very heart of the Pan-Orthodox Ecumenical Council of 2016. As an Independent Orthodox Synod, we continue to recognize the Seven Ecumenical Councils that were Canonical and inspired by The Holy Spirit. We, the Hierarchs of The Holy Synod of the Americas do not recognize the Pan-Orthodox Council Meeting of 2016 as a true Ecumenical Council as defined in the Canons of the Orthodox Church. Your journey toward God are hallowed steps, illuminated by the Grace of the Son of Righteousness, powered by Faith in the Son of God, and blessed with unconditional love as only God can give! We are located in High Point, North Carolina on the corner of Eastchester and Johnson Streets. We are in the Fellowship Building of the St. Christopher's Episcopal Church. Our physical address is: 303 Eastchester Drive - High Point, North Carolina 27262 - The Cathedral phone number is: (336) 869-8607. Divine Liturgy every Sunday morning at 11:00 AM in English. 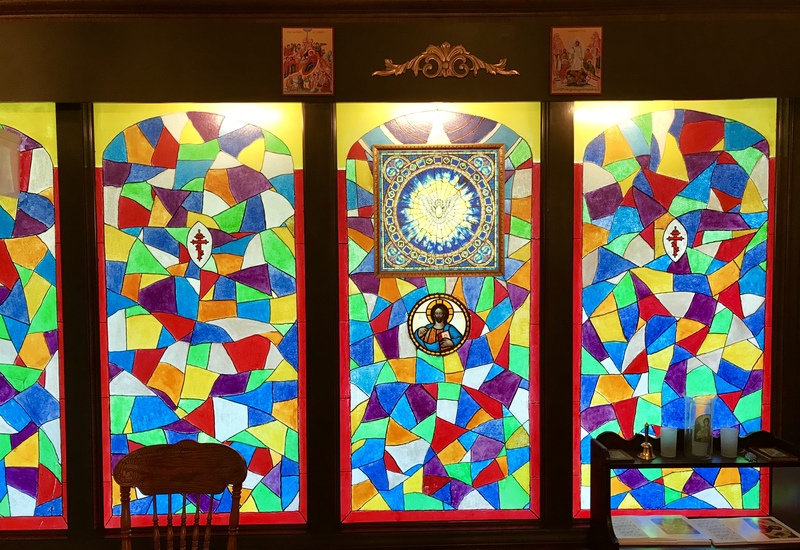 What makes a Church a Cathedral in Orthodox Tradition? A Church that has a Bishop or Archbishop in residence is technically a Cathedral. His Beatitude, +Metropolitan Archbishop Michael is enthroned at St. Seraphim's. Also, St. Seraphim's serves as the THEOCUS Diocese Headquarters. The word Cathedral comes from the Greek work "Cathedra", which means "a place to sit". 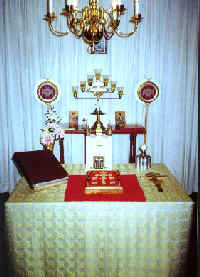 A Bishop's throne in the Orthodox tradition is called "Cathedra".